Good oral hygiene is incredibly important. Taking care of your mouth can help to prevent various diseases and problems from developing with your gums and teeth. Many of these diseases and problems arise from the buildup of plaque and tartar. Plaque is basically a film of bacteria and food debris that coats your teeth and gets under your gums. If this plaque isn’t removed, it can cause damage to your tooth enamel and result in cavities. Eventually, plaque will harden into tartar. Tartar is a hard and porous substance that can only be removed with the use of special dental tools. The presence of tartar makes it much more difficult to brush and floss effectively and can lead to gum disease, including gingivitis and periodontitis. 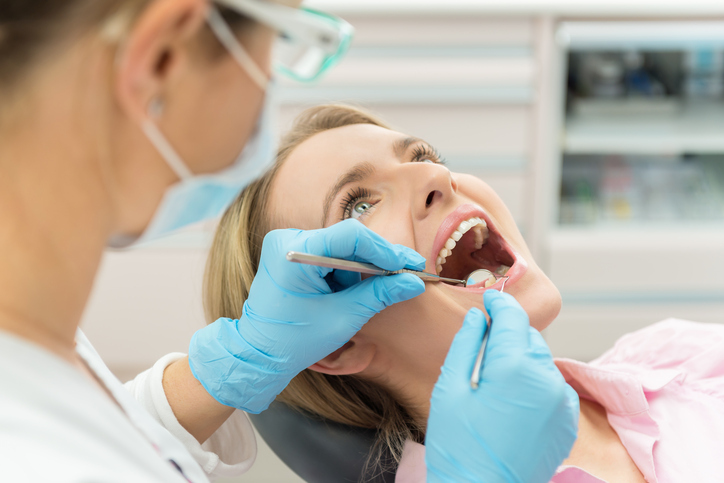 Gum disease can not only damage the bones and tissues that hold your teeth in place, it can also increase the risk of heart disease and other health problems. Brush twice a day – You should brush your teeth at least twice a day to remove food particles and bacteria from your mouth. Brush for at least two minutes using a small to medium-sized toothbrush that has soft bristles. These types of brushes are more effective at removing plaque from hard-to-reach areas, like you molars. Use the right toothpaste – Look for a toothpaste that contains fluoride. Fluoride helps to repair enamel damage caused by plaque. You may also want to look for a toothpaste that contains triclosan, which is an ingredient that helps to fight the bacteria found in plaque. Floss daily – Even if you brush your teeth twice a day using high-quality toothpaste, odds are you won’t be getting to the plaque that’s building up between your teeth. You’ll need to floss in order to effectively get between your teeth. Consider getting an electric toothbrush – If you have trouble holding a toothbrush due to arthritis, an electric toothbrush is a good option. In fact, some studies have suggested that electric toothbrushes are more effective at removing plaque than traditional toothbrushes anyway. When picking an electric toothbrush, make sure that it has the ADA (American Dental Association) seal of approval. Use mouthwash – Mouthwash can help remove food debris that was missed while flossing and brushing. It will also help kill a lot of the bad bacteria in your mouth that causes plaque. You should rinse using mouthwash once a day. Avoid tobacco use – Studies have shown that people who smoke or chew tobacco are more likely to have tartar. Be careful about your diet – The bacteria that leads to plaque and tartar thrives on foods that are sugary and starchy. Limit the amount of sugar you consume. While it’s not realistic to brush your teeth and floss after everytime you have something to eat, you should rinse your mouth out with water to get rid of any food debris. These are a few tips that will help you to remove plaque from your teeth. It’s extremely important that you prevent plaque from building up, or else it’s going to turn into tartar, which can only be removed by a dental professional. For information about our dental services, be sure to contact us at Central Florida Periodontics & Implantology.